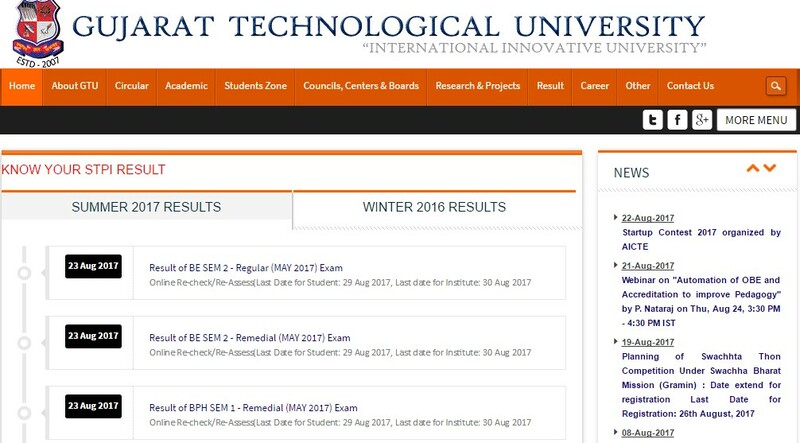 The Bachelor of Engineering (BE) semester 2 regular and remedial examination results of the Gujarat Technological University has declared on its official GTU website. The university was conducted the examination on this May month of this year. So, the students of regular and remedial those who have appeared on the examination can check their results online. While the university has declared the BPH semester 1 remedial examination results on August 23rd Wednesday, 2017. If you like to apply for the re-checking or re-totaling, the application can be accessed online from the date of result declaration, up to August 29. The affiliated institutes of Gujarat Technological University can submit the re-check or re-assess application till August 30. 2. Click on Result tab. 5. Click on ‘Search’ button. 6. Result will be appeared on the new window. 7. Save it as PDF, or Download it on your device. 8. It is good to take a print out for further use. About Gujarat Technological University: The University was founded in 2007 and continuing with the premier academic and research institution. The University established by the Government of Gujarat, Act No. 20 of 2007. Under this University, totally 486 affiliate colleges are operating across Gujarat state. The University offering various courses such as Engineering, Architecture, Management, Pharmacy and Computer Science. Bigg Boss Tamil Week 9: Is Suja Varunee playing herself or imitating Oviya?